Jerome Stewart pursues photography featuring everyday experiences envisioned through an extraordinary viewpoint. This vision is intended to encourage pause and reflection – the photos are often not what they appear to be, but can represent what the viewer would like to see. Jerome, a local Phinney Ridge resident, receives inspiration from his family (including artist / wife, Alice Stewart) and travel. He is a former Peace Corps volunteer, lived overseas for six years and currently travels internationally – camera in tow – four months per year. Alice Stewart’s art reflects images in the past and present that have remained vivid in her mind. She often paints from photos taken by her husband, Jerome, as they both share so many memories from living abroad. Color is the dominant driver in her work. Life’s challenges, it’s great beauty, and the need for unspoken self expression have taken Alice down the artist’s path. Artists present + Live Music. Open only until 8pm. 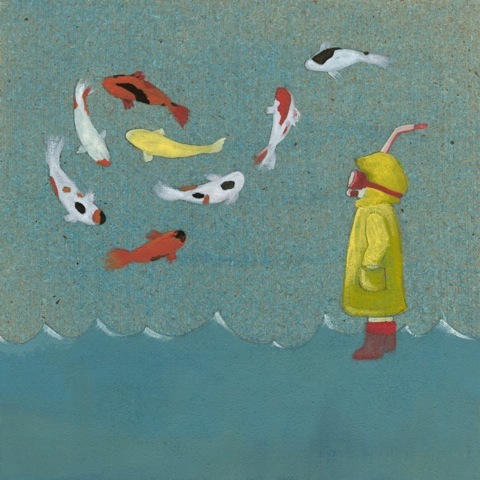 Japanese haiku paintings with gauche and ink by Yachun Peng. Artist present. 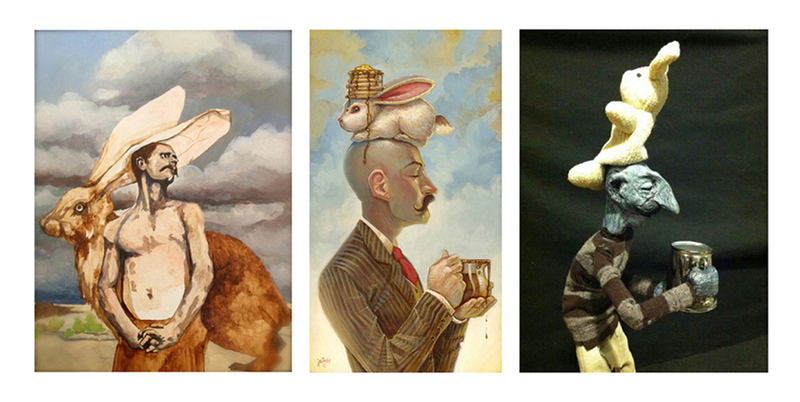 Images by (l to r): Siolo Thompson, Aaron Jasinski, Jeremy Gregory. Bherd Studios and Home Suite Home (Greenwood Art Collective) have been busy tying up the phone lines and playing a game of telephone with their artists. Telephone is the visual-arts version of the telephone game: where a sentence is whispered from person to person, becoming more garbled with each repetition. How do you play telephone with paintings? One artist creates an original work, photographs it, and sends it to the next artist who creates a piece based on the themes of the first—and so on down the line. With only the prior reference to consult, some artists remain strictly faithful to the previous piece, while others embellish and transform, altering the thread as they do. Some threads veer dramatically from their origins, while others end up uncannily similar to the first piece. In the rabbit-themed thread—the first three works pictured above—certain elements wiggle their way into the canon, while others drop out along the way. The longest thread in the exhibition is eight pieces long – does it stay intact or go sideways? Get in the whisper chain to find out. Co-curated by John Osgood (Bherd Studios) and Solace (Home Suite Home), Telephone’s threads will be on display at both spaces, and pieces are available individually. Participating Artists: Aaron Jasinski, Amy Huddleston, Andrea Wicklund, Augie Pagan, Carlos Aguilar, Curtis Ashby, Chris Sheridan, Crystal Barbre, Dan Voelker, Ego, Jeremy Gregory, Joe Vollan, John Osgood, Larkin Cypher, Levi Hastings, Mat Savage, Megon Shore, Parskid, Quincy Quigg, Siolo Thompson, Sam Wallis, & Tatjana Pavicevic. Artists present. Photography by Linda Gayle Parker. Artist present. 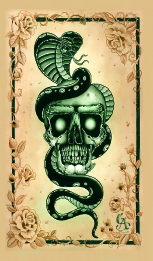 Chris Adams brings his unique style alive with new, watercolor paintings. Artist present. Acrylic paintings by Mat Savage. Artist present. I’m sure my mother had a crush on Van Gogh – his bold colors and brush strokes, or it could have just been his red hair or maybe his desire to lend an ear. No matter her reason behind her crush, she felt I should get to know the masters and their greatest works. Growing up, I liked the soft almost ethereal quality of a Degas ballerina. I then discovered the simple brilliance of Georgia O’Keefe. In art class, I tried my best to emulate them both only to fail miserably then came to the conclusion that I would never become a great painter, not even of houses. But through my youthful angst of being a failed artist, my father bought me my first big-girl camera, an old Minolta SLT-101. My artistic world seemed to open up. Through the lens, I created shapes, views, colors, shades that I could only dream of putting onto canvas. Instead of a brush & paint I created imaged with lens & film. I learned to manipulate scenes through the lens to create a mood similar to my painting idols. I couldn’t have been happier. Or so I thought. 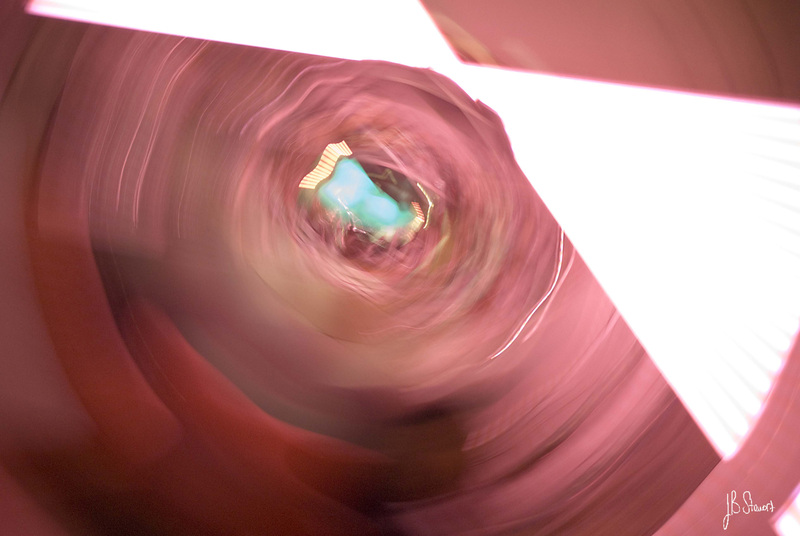 My artistic vision opened up even further with the advent of digital cameras and computer art programs. Not having the confinements of film, I could shoot, examine and reshoot as needed to capture an image in camera to match the image on the screen. No longer was I in the darkroom cropping, cutting, shading for hours on end. At the computer I am able to adjust a setting then quickly readjust if needed. I look forward in anticipation to new discoveries in both technology and vision while continuing to look back into the framework of the great masters who inspired a young girl and a mother who introduced me to them. 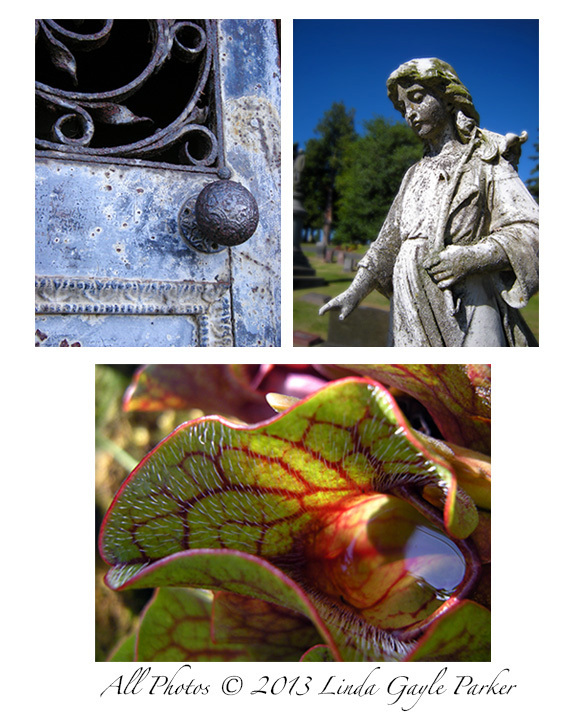 Fine art photography and acrylic and watercolor paintings by Alexis Henry, Gina White and Jon Moore. The human face has always been a constant source of inspiration to me. Just a pretty face is not what makes me want to paint. I am fascinated by the cultural, emotional or the unusual in people and what they can offer. It is my goal to reveal more than just what you see on the surface. After painting people for so many years I have always viewed my subject as a painting within a painting. The skin, eyes and expression are truly a window to the soul and I am very conscious of how I portray that. I have realized that as people we are in a constant state of transformation in our lives and I felt it important to make that a vital element in my work. The story I tell is about change, growth or even decay, depending on how you look at it. The expression is my first priority when I approach a painting. Whether it is a calm, intense gaze or an emotional outburst, I cannot have the traditional posture. I must have life being revealed. The end result is bold, and it all must work together beautifully. My style of painting has loosened considerably over the years and is currently very drippy with many layers of thin acrylic paint. There is an element of losing control, allowing the paint and color to create surprises and often the result is incredible. To further intensify the image I add layers of textile patterns across the skin. These layers are blended into the skin as well as dimensional by cutting shapes out of additional paper and working into the portrait. The why, what, or how I achieve what I do is still somewhat of a mystery to me. Letting go of control in my painting has proved successful though painful at times. I know I have produced something really good when I feel an incredible thrill of feeling something emotional, beautiful and original and not understanding how I produced it. When the viewer can experience a fraction of this feeling that I do, then the success is a feeling that is impossible to describe and the satisfaction is amazing. Featuring Jen Grabarczyk: Her work functions as actions of bearing witness – where consciousness, memory, narrative and time are processed through a choreographed integration of cerebral representations and bodily movement. The works included in this little show fall within those parameters, yet more specifically are visual studies in structure and containment, suspension and fusion. Plus, Live music by Lindee Hoshikawa, a Jazz/Blues/Folk based singer-songwriter. Artists present. Realistic paintings on wood and canvas by Derek Ross. Artist present. 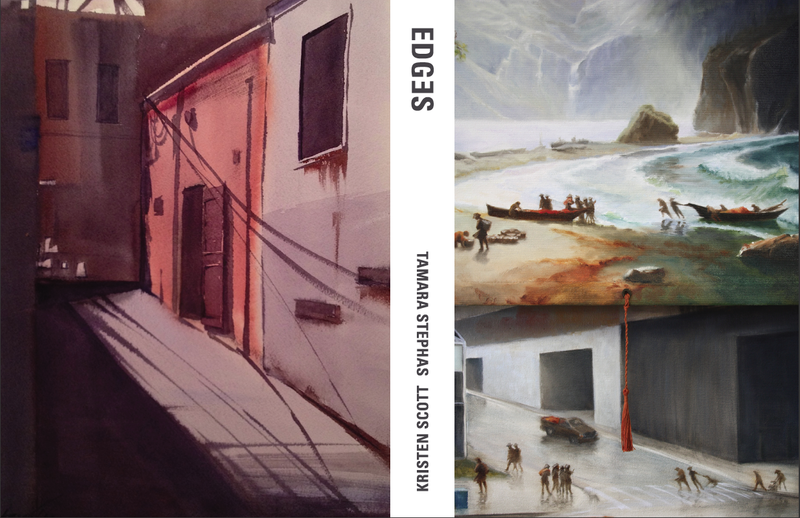 EDGES: Recent work by artists Tamara Stephas and Kristen Scott that looks at the boundary between nature and the built environment. Tamara Stephas explores the relationship between humans and nature in an era of rapid environmental change. Her new landscape paintings pay homage to the power and beauty of the Pacific Coast, with a nod to the romantic imagination of the era of manifest destiny. As an architect and artist, Kristen Scott is drawn to edges – the line of how a building meets the sky and the ground, the shadow pattern on a wall, the framed view through a window that separates inside and out. Working in watercolor and often plein-air, she describes the unique qualities of a place, by exploring line, shape and the space between. Opening Reception: Join us for an opening reception on Friday, March 8 from 7-9 pm. Dates of Show: February 27 to March 29. Artists present. Located across the street from the new Fred Meyer and above Mori Japanese Restaurant, The Studio of Awesome features Carol Made jewelry, Weaving One handbags, Scary White Girl crocheted goods, Playful Potter pottery, Mayhem Here paintings, Claire Jauregui art prints, and Tote2Go reuseable grocery bags. Join owners Sean & Sheri as they celebrate their gallery’s 3rd Anniversary during the March 8th art walk. Their new show, MONSTERS & MASHUPS will feature the in-house design team of Funko (www.funko.com) making custom one-of-a-kind toy mashups from Amos, Reis, Rob, Tim and Wilky. 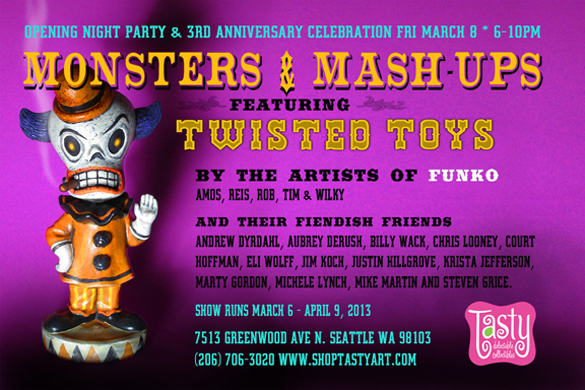 Plus a group art show to include 3-d sculpture and 2-d paintings from this motley crew of (mostly*) local artists: Andrew Dyrdahl, Aubrey Derush, Billy Wack*, Chris Looney, Court Hoffman, Eli Wolff, Jim Koch, Justin Hillgrove, Krista Jefferson, Marty Gordon, Michele Lynch*, Mike Martin and Steven Grice. Show runs March 6 – April 9, 2013. Artists present. Featuring Maggie Sharar: Maggie’s creative journey began long ago in the land of sand and sun. Florida. In 2010 the artist and her young family made their way west to Seattle. Inspired by a new environment and a fresh start the artist began creating. 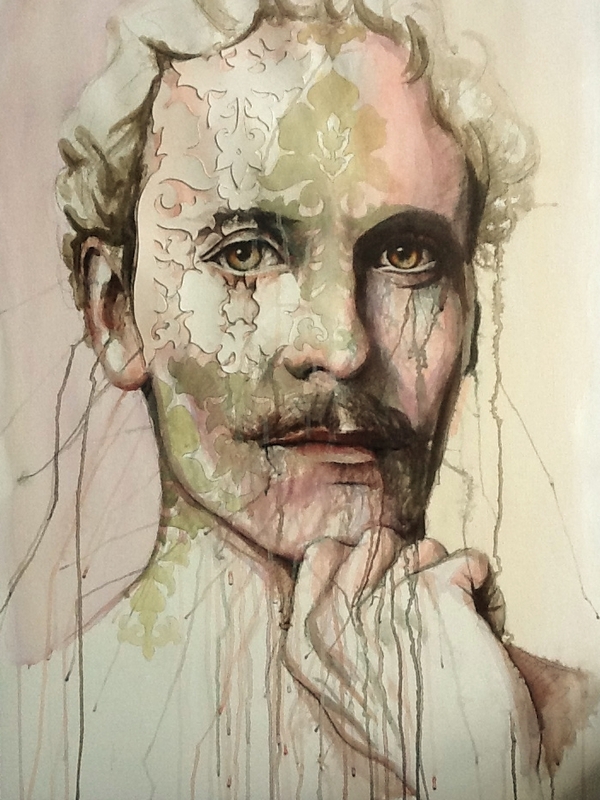 Maggie’s latest work illuminates a lust to let go. To leave the physical body and find the roots of the subconscious. Each piece takes a journey into the layers of the body mind connection, and questions what lies beyond. Most days Maggie can be found nannying, caring for her family, and sketching. Recently the artist began a new journey supporting women in labor as a birth doula. Open Mic Night, sign up starts at 6:15pm. This entry was posted in Uncategorized and tagged Art Up Phinneywood, greenwood, phinney, Seattle monthly artwalk by artupphinneywood. Bookmark the permalink.